Janet Coleman's two volume history of European political theorising, from the ancient Greeks to the Renaissance is the introduction which many have been waiting for. 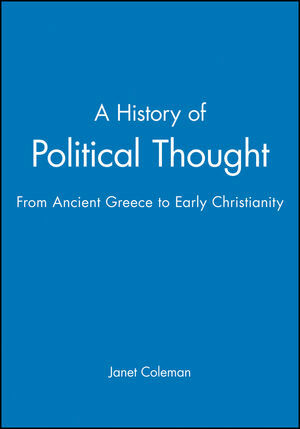 In this volume, Coleman discusses the acknowledged great works of Greek, Roman, and early Christian writers to show how the historical contexts in which certain ideas about ethics and politics became dominant or fell from dominance, help to explain the ideas themselves. Throughout she draws on recent scholarly commentaries written by specialists in philosophy, contemporary political theory, classical languages and cultures, and on ancient and early Christian history and theology. Janet Coleman shows that the Greeks and Romans' arguments can be seen as logical and coherent if we can grasp the questions they thought it important to answer. 5. CiceroÆs Rome and CiceroÆs Republic (De re publica). "These volumes cover the scholarship of the last four decades with considerable care and in an impeccably cosmopolitan manner...in its second volume, the best single-volume history of medieval political thought to put into the hands of any intelligent and serious student...Coleman's History is a fine achievement and of clear use value throughout. It breathes the spirit of a very different epoch, while providing help for all of us who must deal, in our respective roles, with the ideas that it chronicles." John Dunn, University of Cambridge.